Nippon Paint Malaysia Group and IJM Land Berhad recently revealed the winners of the Asia Young Designer Award (AYDA) 2017 and the announcement was made in conjunction with the 10th anniversary of AYDA. Themed ‘You for Tomorrow: Future Living as Envisioned Today’, this year’s competition was aimed at challenging the foresight and the technical ability of young professionals to create a design concept which is relevant, meaningful and meets the needs of tomorrow’s dwellers and societies. 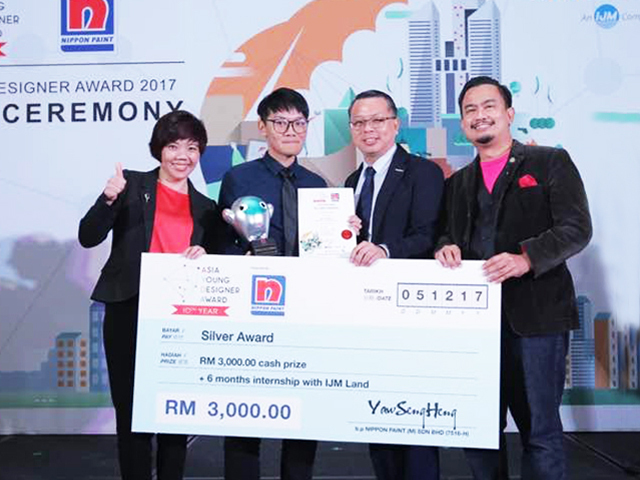 Former UTAR Bachelor of Science (Hons) Architecture student Ng Wai How took home the Gold Award for the Architecture category in the competition, with a cash prize worth RM5,000 and six-month paid internship from IJM Land. He also earned a chance to learn from the Malaysia Learning Programme and represent Malaysia to compete against other Asian countries, including Singapore, Philippines, Bangladesh, Thailand, Pakistan, Indonesia, Iran, Vietnam, China, Japan, Hong Kong, Taiwan, India and Sri Lanka for the AYDA 2017 in March 2018. The principal idea of his winning design “War Museum—an extension of Tugu Negara” was to bridge the gap between the past and the present—an absent narrative within the National Monument. His design balanced the nuances of heritage and the natural landscape without overpowering the existing venue of commemoration which at the same time provided a refreshed dimension to the idea of conventional war museums. 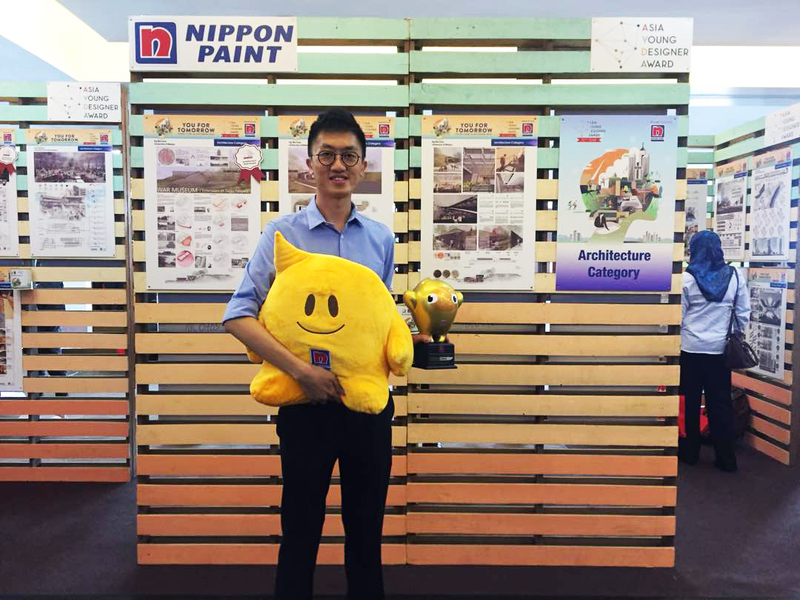 On the other hand, UTAR Bachelor of Science (Hons) Architecture student Tan Ying Kuan won the Silver Award for the Architecture category in the competition. He received a cash prize of RM3,000 and six-month paid internship from IJM Land. His project attempted to study the concept of “sharing” in modern society by designing a temporary accommodation which is also a guesthouse that merges the visitors and the community in one place. He believed the sole and absolute element that a healthy society needed was the willingness and the opportunity to share. His project, named “Sama-Sama”, was targeted to provoke people to share their goods, share their emotion and share their ownership with others. He also expressed his gratitude to the lecturers who have facilitated him in the production of this design and he believed that this honourship was the best evidence that proved their hard-work and dedication in delivering the knowledge. “As a part of the Department of Architecture and Sustainable Design, I feel that we all are lucky to have all these enthusiastic and responsible pathfinder in our journey of study,” said Tan. He also encouraged all his juniors to grab the opportunities to participate in the competition, regardless of the results. He hoped this award would be an inspiration for others, just as how he was inspired by his seniors. Launched in 2008, the AYDA was designed to identify and nurture young design talents across 15 countries in Asia by providing them a platform to develop and share their design ideas with professional designers such as architects and interior designers. It also provides participants with industry knowledge, personalised coaching, mentoring and skill-building through various workshops and offers them the opportunities to learn from their fellow peers from across borders.